Youth creative writing organization 826CHI recently released The 826CHI Compendium, Volume VI, an anthology of poems and stories on the theme of discovery written by over one hundred Chicago students from the past two years of programming. 826CHI is the Chicago chapter of 826 National, a nonprofit organization dedicated to amplifying voices of youth through the power of creative writing. Here, the Weekly presents two favorite pieces from the collection. In the first, a prose piece by Isabella S., the narrator imagines a restaurant that she will one day own. The author considers how her restaurant might serve as a de-stresser, where people come to relax. The piece draws the reader in: you feel as though you are sitting right there in her restaurant, enjoying a good meal and great conversation. The second piece, a poem by Gael G., is a truth-speaking meditation on daydreams, imagination, and family. Anyone who has been a young person can likely relate—who hasn’t fantasized about being some sort of animal that wasn’t capable of flying, but you imagined that it could anyway? The poem is imbued with this kind of hope, inviting you into a world where, with the help of family, humans rise like phoenixes when they fall. The concept of my restaurant will be to bring everyone together. Families, friends, and cultures can meet and unite as one (maybe I should be a politician or a speechwriter). Dishes from all over the world (shipped to my restaurant) will be served around the room. It will be a haven where no one has to dress up and everyone will be open to many opinions. It won’t be open in the morning (to let my workers have more sleep), but it will be open for lunch and dinner. My restaurant will be medium-sized, with only one floor and 20 tables. It will be painted sky blue, with open windows and gray, cushioned seats. Slow, acoustic music will be played to give a calming aura. Booths, stools, and regular wooden chairs will be placed together in the room. The whole floor will be clean, shiny, and have a flowery smell. A menu will be placed in front of you, but the food will come around. I will call my restaurant Haven and it will be associated with Fogo de Chao, Texas de Brazil, and many others. Meat, steak, rice, and veggies will be carried around by waiters. Seafood, too! Everything will be on the menu, and you can ask for the meal to come around. My signature dish will be meatloaf topped with soft, creamy tomato sauce. It has a soft texture and it’s really warm. There will be the option of BBQ sauce, too. The cost will be cheap, only around $30 or so. Each dish will be going around, like a buffet, so no math will be needed to add the costs of what you ate. Dessert is a big thing. It ranges from ice cream to cakes, and can be hot or cold. It’s usually sweet, but maybe don’t eat chocolate if you don’t want (more) pimples. I’m old. I’m letting my children take over. I should’ve retired a long time ago. But don’t worry, I’m happy with my work. I’ve brought people together and brought down their stress. There’s still stress in the world, and hopefully my restaurant will continue to help with that. 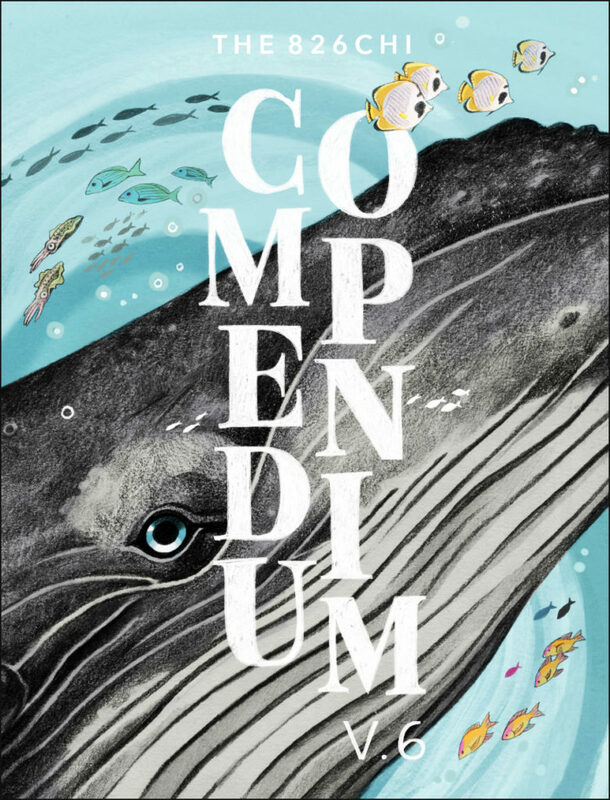 The compendium will be available later this month at the seventy-seven branches of the Chicago Public Library. It can also be found for sale at 826Chi’s Secret Agent Supply Co., 1276 N. Milwaukee Ave.; Build Coffee, 6100 S. Blackstone Ave.; Women & Children First, 5233 N. Clark St.; City Lit Books, 2523 N. Kedzie Blvd. ; and other fine booksellers. Maple Joy is a contributor to the Weekly. She is from Cleveland but has lived in the Chicago area for almost five years. She is obsessed with Chicago food. In her spare time, you can find her biking on one of the Chicago trails or hanging out at a Chicago event or festival.